Chill of Fear pretty much has Ani-bait written all over it… despite the fact that the summary doesn’t really do much justice for the depth of story that this book covers. Then again, having so much plot going on in the background as well as so much plot going on in the forefront only tends to make one a little confused. Even though all the side stories converged at the very end, I still felt like some things could have been left out. But no matter, Chill of Fear was very enjoyable. And although there was a lot of tacky dialogue and a lot of convenient “fated to be” placements of events, I chose to go with the flow and enjoy the book. Our characters were great, even if Diana was a bit stubborn and her stubbornness carried on for longer than I would have liked. The historical murder mysteries were interesting, the story progression was smooth, and the atmosphere DID manage to get a bit creepy at times. Unfortunately, there was a lot of “the Universe” in play for use as a deux ex machina throughout; even for a book surrounding a psychic with precognitive abilities and another psychic who can communicate with the dead, using “the Universe” as a means to explain all your answers can seem like a bit of a cop-out. In contrast, however, I still DO enjoy the more “scientific” explanations that the Bishop/SCU world gives for the existence of psychic abilities--that all humans have the latent ability to be psychic, but that others are just more sensitive to the electromagnetic waves generated when we use our brains. This is disregarding the fact that some of the psychic abilities present (such as precognitive abilities) cannot seem to be accounted for by psychics being extra attuned to the electromagnetic pulses generated by other people as well as residual electric stimuli left from extreme emotions. Because it doesn’t explain how you can see the future. But whatevs. I still continue to enjoy these books. Chill of Fear follows Quentin Hayes and Diana Brisco as each finds themselves at a place called The Lodge, a secluded, yet fancy little mountain resort, that has a long history of secrets as well as rumors of hauntings. Quentin has been returning to The Lodge intermittently the past few years since he became law enforcement. Twenty-five years ago, a young girl had been murdered and there has never been any trace of the killer. For twenty-five years, Quentin has felt that it was his responsibility to bring justice to Missy’s death--he was the one who had found her body, he had unofficially adopted her as a little sister for that summer they’d met, and he blames himself for not listening to Missy when she tried to tell him that there was something at The Lodge that genuinely had her frightened for her life. Diana Brisco has spent her entire life medicated for what society deems as abnormal mental health problems. Ever since the age of eleven, she has always been experiencing blackouts, seeing and hearing things that shouldn’t be there, and generally making all the people around her nervous with her restlessness. The only problem is that, despite having been conditioned to believe that she has an illness that needs to be fixed, Diana has always felt that she was normal and able to function properly as a normal human being. At present, Diana is attending a painting therapy course at The Lodge. After her last doctor took her off of all her medications, she actually feels more in control of her life and wants to do what she can to keep from being heavily medicated ever again. And it is at The Lodge that she meets Quentin who recognizes her immediately, not as a person with an illness, but as a fellow psychic who just needs to realize her abilities and learn how to cope with them. Diana is a medium, it turns out. And “the fates have aligned” at this present time to bring Diana and Quentin together at The Lodge to put to rest questions that have been plaguing their lives for the past many years: Diana’s psychic abilities and her connections to The Lodge, Quentin’s unending search for answers to Missy’s death as well as the deaths and disappearances of many other children that may be associated with The Lodge, and an evil presence that seems intent on remaining at The Lodge forever. There is an awful lot going on in Chill of Fear that probably could have been left out or shortened. And on top of that, the twists and the conclusions relied very heavily upon “the Universe” and how “things must happen the way they happen” and other such reasons to do with fate and pre-ordained events. I’m not sure I know how to feel about that. 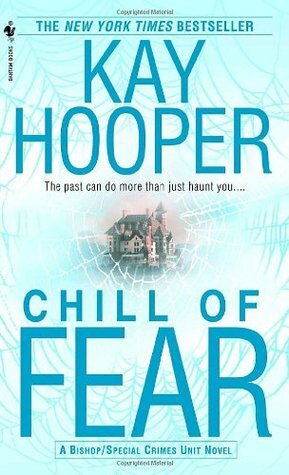 Chill of Fear had a lot of potential to blossom into an eerie, spine-tingling murder mystery and haunted hotel type of storyline, but everything hinged on the existence of an evil presence that was really only there in hindsight and as a background player and finally presents nearing the ending when all is said and done. The creepiest parts of the book were random and were the fairly classic, “I think I see something in my peripheral, but it’s not there when I really look,” with lights turning off and whispers floating in the air, and even a thunderstorm to mess with a psychic’s electromagnetic waves. Nonetheless, this book managed to keep me hooked and turning the pages to reach the conclusion. I enjoyed the book, I enjoyed the characters, and I still continue to enjoy the world of the Bishop/SCU series.